What is a bottle bill state? How does it work? Beverage container deposit laws, or bottle bills as they are more commonly known are designed to reduce litter and increase recycling for bottles, cans, and other materials. Bottle Bill States offer a refund per can or bottle you recycle that varies per state. You’re probably thinking, how does it all work? Well, it's pretty simple. When a retailer buys beverages from a distributor, a deposit is paid to the distributor for each container purchased. 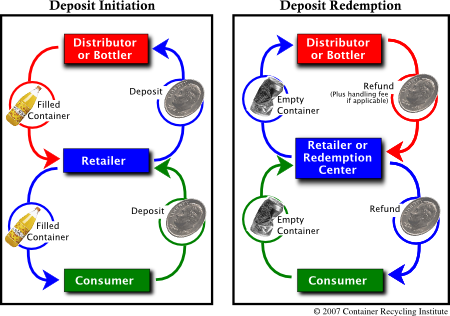 The consumer pays the deposit to the retailer when buying the beverage, and receives a refund when the empty container is returned to a supermarket or other redemption center. The distributor then reimburses the retailer or redemption center the deposit amount for each container, plus an additional handling fee in most states. Unredeemed deposits are either returned to the state, retained by distributors, or used for program administration. So far there are ten bottle bill states where you can receive a small deposit back for returning the empty container to the store. The states are California, Connecticut, Guam, Hawai, Iowa, Maine, Massachusetts, Michigan, New York, Oregon, and Vermont.